This month’s club card is a tribute to my favorite baseball team – St. Louis Cardinals. Go Cards!! Converted this regular, but really cute bird from Stampin’ Up! bird builder punch, into my favorite red bird. I think you will see that I snipped a piece from a second punch of the wing in Real Red Card Stock for the tuft of feathers on his head, and a couple of separate punches of the tail feathers for fluffier tail. The fence is made from strips of Whisper White Card Stock. I ran it through the Big Shot using the wood grain embossing folder to give it that real wood, whitewash look. 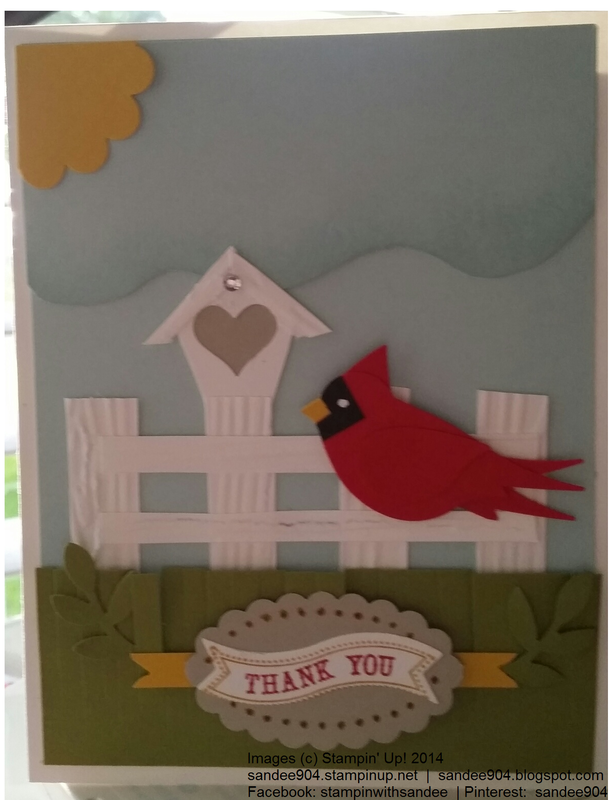 The birdhouse on top of the fence post is made from a small, rectangle piece of Whisper White Card Stock, with scraps leftover from the fence for the roof and the door is the new itty bitty heart punch.